Cling Stamp from Impression Obsession featuring the sentiment "Gratitude is the Pathway to Happiness". This is a clear photopolymer stamp set measuring 4 x 6 inches. This clear stamp set features a bicycle, "May you have a sweet ride through life", "Memory Lane", "Enjoy a relaxing day", and "Riding Pretty". 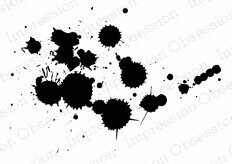 Cling Stamp from Impression Obsession featuring a splatter background. 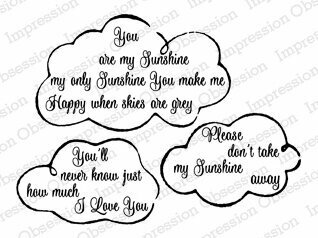 Cling Stamp from Impression Obsession featuring clouds and the song "You are my sunshine, my only sunshine, you make me happy when skies are grey. You'll never know dear how much I love you, Please don't take my sunshine away". Cling Stamp from Impression Obsession featuring the first half of Edgar Allan Poe's "The Raven". It reads from "Once upon a midnight dreary..." to "...with such a name as 'Nevermore.'" Cling Stamp from Impression Obsession featuring the quote from the Wizard of Oz "Follow The Yellow Brick Road". Cling Stamp from Impression Obsession featuring Beauty Roses. 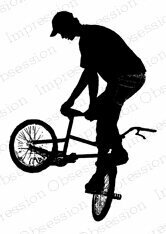 Cling Stamp from Impression Obsession featuring a bicyclist. Cling Stamp from Impression Obsession featuring the letter "A" monogram. Cling Stamp from Impression Obsession featuring the letter "B" monogram. 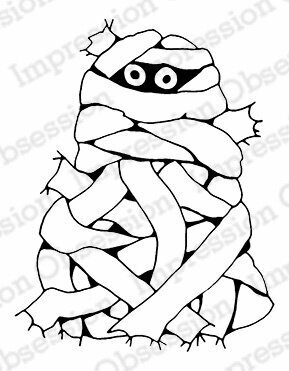 Halloween themed cling stamp from Impression Obsession featuring a Mummy. Love themed Impression Obsession cling stamp featuring the sentiment "Happy Valentine's Day". 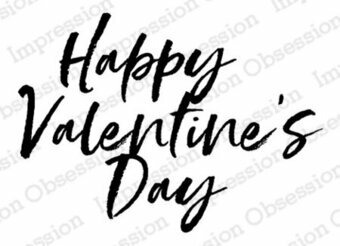 Cling Stamp from Impression Obsession featuring the sentiment "Happy Valentine's With Love". Cling Stamp from Impression Obsession featuring the music and lyrics to Silent Night. 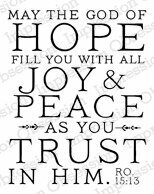 Christian Cling Stamp from Impression Obsession featuring the Bible Verse "May the God of hope fill you with all joy & peace as you trust in Him - Romans 15:13". Cling Stamp from Impression Obsession featuring the sentiment "Happy Fall". 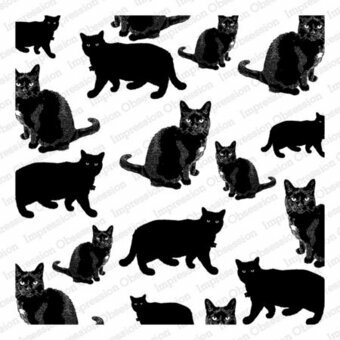 Cling Stamp from Impression Obsession featuring a background of Black Cats. 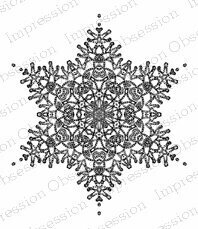 Impression Obsession cling stamp featuring the sentiment "wishing you a Merry Christmas with love." Impression Obsession cling stamp featuring a Sweet Dog. Love themed clear stamps from Impression Obsession featuring decorative hearts. This is a clear photopolymer stamp set measuring 4 x 6 inches. Our clear stamps are made in the USA from the highest quality photopolymer. 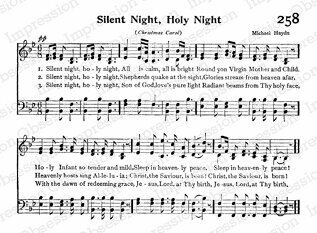 Impression Obsession cling stamp featuring the Christmas sentiment "silent night, holy night, all is calm, all is bright". 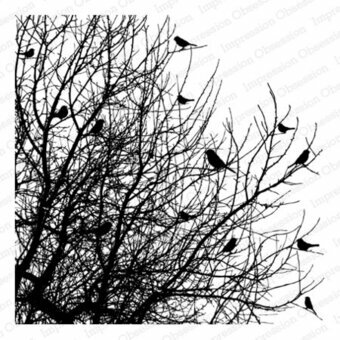 Cling Stamp from Impression Obsession featuring birds on tree branches. 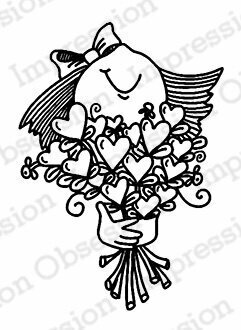 Love themed Impression Obsession cling stamp featuring a girl with a bouquet of hearts. This wood mounted stamp measures 3 x 3.25 inches. The actual stamp size is approximately .25 inches less in both width and length. 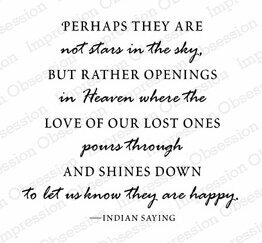 Features the Indian saying "Perhaps they are not stars in the sky, but rather openings in heaven where the love of our lost ones pours through and shines down to let us know they are happy." Clear Stamp from Impression Obsession featuring the inspirational sentiment "It is what it is, but it will also become what you make of it." Christmas themed Cling Stamp from Impression Obsession featuring a wreath. 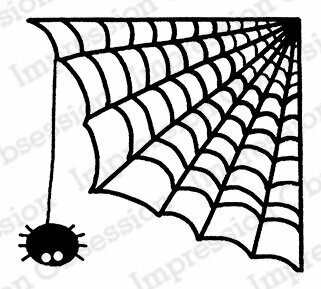 Halloween themed cling stamp from Impression Obsession featuring a spider and a spiderweb. 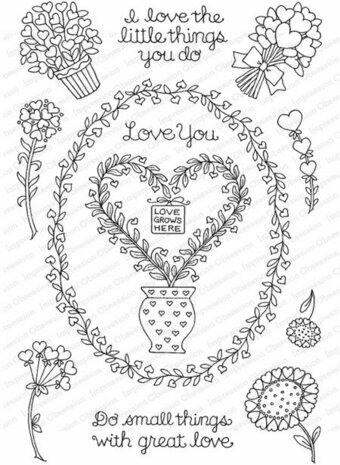 Love themed clear stamps from Impression Obsession featuring decorative hearts and loving sentiments. This is a clear photopolymer stamp set measuring 4 x 6 inches. Our clear stamps are made in the USA from the highest quality photopolymer. Love themed Impression Obsession cling stamp featuring the sentiment "Thank you for being my Valentine all these years". Fall themed Cling Stamp from Impression Obsession featuring the sentiment "Autumn, nature's grand finale". 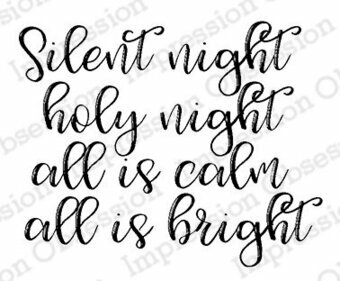 Cling Stamp from Impression Obsession featuring the sentiment "O Holy Night". Halloween themed cling stamp from Impression Obsession featuring a Scary Pumpkin. Cling Stamp from Impression Obsession featuring the sentiment "Sending you love and special wishes, tucked inside are hugs and kisses". 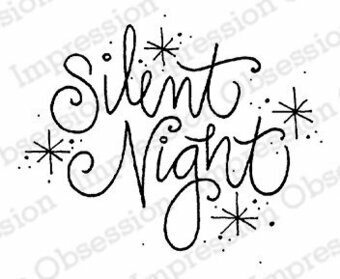 Impression Obsession cling stamp featuring the Christmas sentiment "silent night". 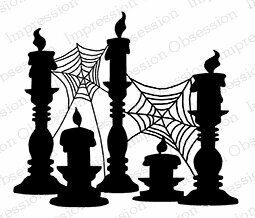 Halloween themed Cling Stamp from Impression Obsession featuring spooky candle silhouettes. 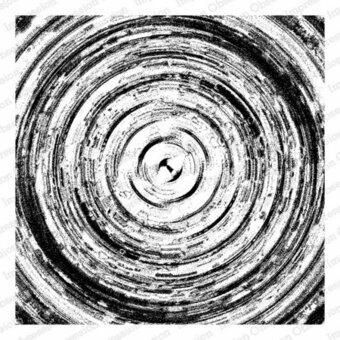 Cling Stamp from Impression Obsession featuring a background of circles. Impression Obsession cling stamp featuring the sentiment "All You Need Is Love". Halloween themed Cling Stamp from Impression Obsession featuring the phrase "Along Came A Spider". 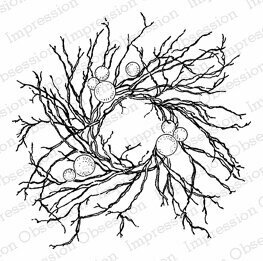 Impression Obsession cling stamp featuring the sentiment "you will forever be my always". Cling Stamp from Impression Obsession featuring the sentiment "There is always something to be thankful for". 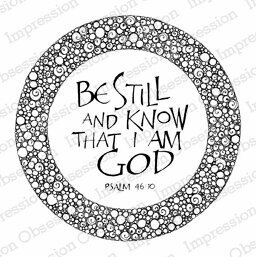 Christian Cling Stamp from Impression Obsession featuring the Bible verse "Be still and know that I am God - Psalm 46:10". Cling Stamp from Impression Obsession featuring the sentiment "Girls Just Wanna Have Fun". 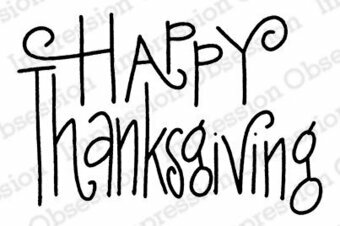 Thanksgiving themed cling Stamp from Impression Obsession featuring the sentiment "Happy Thanksgiving".